1 School of Interdisciplinary Bioscience and Bioengineering, Pohang University of Science and Technology, Pohang 790-784, Republic of Korea. 2 Department of Internal Medicine, Seoul National University College of Medicine, Seoul 110-799, Republic of Korea. 3 Center for Genomics and Proteomics & Stem Cell Core Facility, Lee Gil Ya Cancer and Diabetes Institute, Gachon University of Medicine and Science, Incheon 406-799, Republic of Korea. 4 Korea Institute of Science and Technology, Seoul 136-791, Republic of Korea. 5 Department of Chemical Engineering, Pohang University of Science and Technology, Pohang 790-784, Republic of Korea. 6 Integrative Biosciences and Biotechnology, Pohang University of Science and Technology, Pohang 790-784, Republic of Korea. 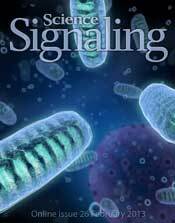 S. Chae, B. Y. Ahn, K. Byun, Y. M. Cho, M.-H. Yu, B. Lee, D. Hwang, K. S. Park, A Systems Approach for Decoding Mitochondrial Retrograde Signaling Pathways. Sci. Signal. 6, rs4 (2013).